Cranberries are the unsung heroes of holiday meals in my opinion. 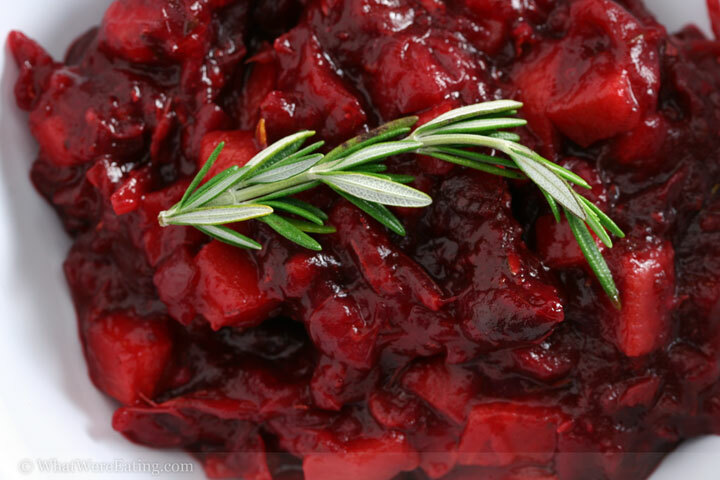 With sooooo many other really uber-rich dishes at the table, it’s the cranberry sauce that give your taste buds a break and brightens up the meal. It’s just like me – tart, with a touch of sweetness. 😉 (Alright, so maybe I’m more tart than sweet, but who’s keeping tabs?!?) For our pre-holiday feast, I made a fresh cranberry, persimmon and rosemary sauce. The addition of rosemary to the sauce added just the right hint of herbiness to really play well with the herb roasted turkey breast. As everybody knows, turkey and cranberry are BFF, just like me and pork fat. Rather than having two cranberry sauces at the feast, Nicole made a cranberry applesauce with ginger. While I can’t say that apple sauce was ever a traditional holiday dish for for my family, I do love a good homemade apple sauce and the addition of the cranberries and ginger really set this one off. All and all I would say that we ate damn well at our pre-holiday feast. Geez, maybe we at too well… now the actual Turkey Day is going to have a lot to live up to! This is definitely my new favorite cranberry sauce! And there aren’t many fresh cranberry sauces I like! My sister and I still love the Ocean Spray jellied sauce from the can! thanks nicole! you know, i actually like the crap in the can too, although it’s a completely different beast – (more like jelly!) but i do prefer and looooove a good fresh one! Lucky us for finding you! We received a persimmon in a care package from friends in California – just about to prepare my hubby a spontaneous T.G. dinner which will include your Turkey Breast recipe and this cranberry sauce with Persimmons! He’ll be out of town for the actual day (working in Europe!! Thank you and I’m glad I found this site! Okay, starting to get a little bit jealous I don’t live closer to you, because this meal sounds awesome. If I came, I definitely would have brought something wrapped in bacon. I’ve never used persimmons before, what would you say they taste like? Definitely gonna try this one out on the in-laws. Thanks, A and T! Although my mother has her signature cranberry sauce dressing for Thanksgiving day, I can’t wait to try this recipe in the coming weeks! It sounds incredible. Thanksgiving guys! I especially love this sauce with persimmons! wow, what a great combo of flavors and rosemary herb inspiration. I’m digging those amazing enchiladas too! I missed this for Thanksgiving, but I’ll be making this for Christmas. Will persimmons still be in season then? How can I tell if they’re ripe? Thanks! For the persimmons cranberry sauce, how much cranberry do you have in a bag? Are there one lb or 3lbs. Please specify. Thanks a million. What weight of cranberry did you use in the persimmons cranberry sauce. I made this last year and loved it. But can’t remember exact quantity of cranberry. it was a 1 lb bag! thanks, xina! Amanda. Thanks for the info. Any idea if this can be canned?